I wrote a post back on August 02, 2010 that discussed the possibility of designing and building a low cost modern house. This is no small task because modern houses, with their clarity often misunderstood as simplicity, are actually demanding and require a skill level of the contractor building such a house to think and plan far in advance of the current status of the work. This type of skill comes at a cost and getting a contractor who simply fits the bill as a low-cost provider to build a modern house will yield you a house that is something different altogether. I have been reading up on my Richard Neutra and Marcel Breuer, looking at the plans and detailing that they used to see if I couldn’t get a glimpse into the idea that the construction process would be simplified (and mechanized) in a manner that would expedite the construction process which we all know means the end result would cost less. There is a good friend of mine who approached about a year ago to design for him and his family a modern style weekend home. While he appears to be doing pretty well for himself (evidence – he can afford me snap, gun fingers + smirk/wink), he isn’t King Midas. This was to be a weekend house just outside of town and they wanted it to be done as cost-effectively as possible (who wouldn’t?). During our initial conversations, he wanted to set the budget at $125/ SF and I told him I didn’t know if I could do that … I’ve been to their house and if the finish level there was to be any indication, cargo boxes and un-air conditioned tensile structures (tents)were not what they had in mind. Another reason I had my doubts was that this project was located in the middle of nowhere and I couldn’t attest to the availability of materials or the skill level of the contractors available to us. In addition, we would have to install propane, run underground electrical about 500 feet to get from the road to the house, and put in a septic system. I am a city-boy (man) and my knowledge of septic systems is poop flows downhill and bacteria blahbedity blah blah blah. I don’t know how much those things cost or how much dynamite would be required to put them in the cliff-like rock site they had purchased. When the design development phase was completed, we had the design development drawings budget-priced by what has since become the contractor on the project. We initially had 3 different construction firms look at the drawings and ended up selecting the contractor who did what he said he would do and asked the most questions during the bid phase. 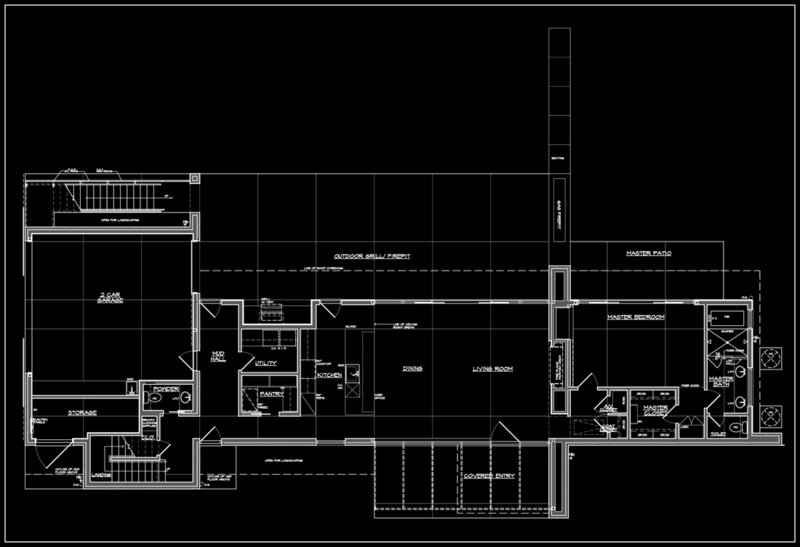 (*Note to contractors: Architects don’t mind questions, they let us know that you are actually looking at our drawings). 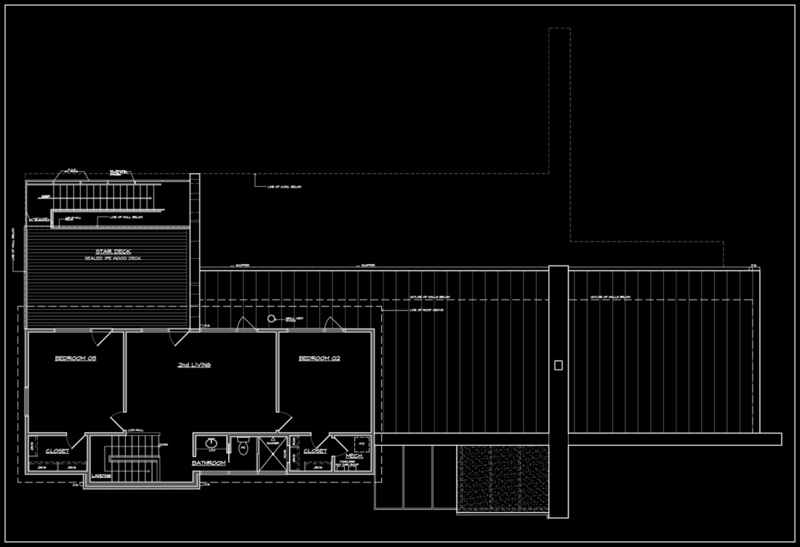 We ended up with 3,257 total built square footage with a construction budget cost = $126/SF. Another way of looking at this is 2,632 air-conditioned space = $156/SF. Not bad if I do say so myself. In an effort of full disclosure, the price will go up from here. These were construction budget numbers and there were lots of unknowns still involved – one example is that the owners were thinking IKEA cabinets that they would put together themselves whereas I am trying to talk them into allowing the contractor to essentially build MDF boxes and paint the cabinets (and then pay for some super-awesome hardware for some flash!) I would think that the delta between the toe is minimal really but having the cabinets built would cost slightly more. For a while, I had them thinking clear-stained vertical grain rift cut white oak – they don’t have that much cabinetry – 24 linear feet in the kitchen – and it would add some warmth and textural interest to the space. So you might be thinking what does this house have to do with the “Low-Cost Modern House Challenge?” Hopefully not but just in case I will tell you; this is something that I have spent quite a bit of time thinking about and working on. Maybe it started off as a self-serving exercise since I myself would like a brand new modern house and I know that I can’t afford what is out there on the market – the good news is that I think I am qualified to do something about that. Form, massing, light, material quality – these are all ethereal things that I define for myself their worth and value. You may not like corrugated metal siding but I do when used a particular way and detailed in a manner that elevates its humble status to something more sublime. The house I designed above has just a few little tricks going on – most of which can’t be appreciated at this macro scale. Things like how a material turns the corner, or how the second level form cantilevers over the windows to recapture some exterior space which assigns it as an implied use … hard to see, easier to experience. It might be hard to tell at this scale but the ceiling in the main living space (as indicated in the section above) follows the shape of the roof to provide some height and volume to a room that has an 8′-0″ plate line. In order to distribute electrical, air conditioning duct work, plumbing lines, etc. I created a dropped soffit that runs along the circulation space parallel to the main wall. This soffit makes distribution extremely simple and therefore cost-effective. A trained eye will probably see that the building is made up of two rectangular extrusions – one with a shed roof and the other with a gable roof and I just offset them from one another to create some very simple building massing that hopefully looks a little more interesting than describing it. Weekend House – Low-Cost Modern Residence from Bob Borson on Vimeo. All of these things I discussed are going to play an important role in the Low-Cost Modern House Challenge. And $160/ SF is pretty nice and is hopefully in the neighborhood of where the LCMHC house eds up.